FFDSHOW is an open source DirectShow decoding filter designed to decompress many formats, some of which include XviD, Windows Media Video (WMV), DivX and MPEG-1/MPEG-2. 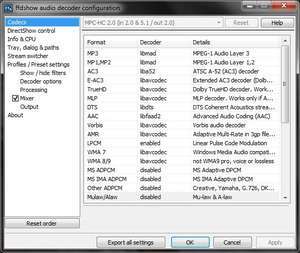 It uses code from several other freeware/open-source projects such as mplayer for visual enhancement, libavcodec rom ffmpeg for decompression and basing its-self on another DirectShow filter from XviD. For security reasons, you should also check out the FFDSHOW (All in one codec) download at LO4D.com which includes virus and malware tests. Additional screenshots of this application download may be available, too. 4.81 out of 5 based on 116 ratings. FFDSHOW (All in one codec) has a presence on social networks. FFDSHOW (All in one codec) download been highly rated by our users. This file download is licensed as freeware for Windows 7 / Vista / XP / 2000 / ME.